The 1MW Plant is certified by SGS. “The voluntary verification has occurred by means of inspection visit carried out from the manufacturer with a satisfactory outcome. The results of the visit are on Technical Reports RVV.DM.MI12.003 and RVV.DM.MI12.004. 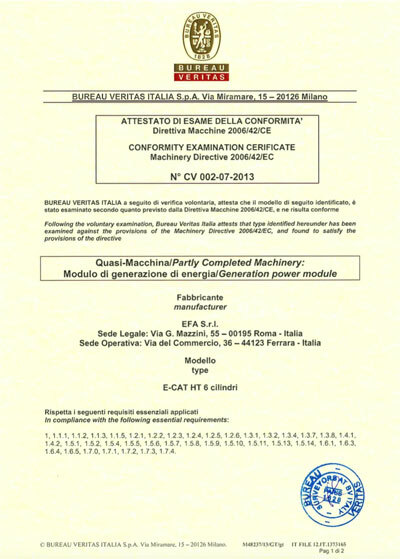 The E-CAT -HT has been granted a Voluntary Conformity Examination Certificate of compliance with the ” Machinery Directive N. 2006/42/EC” from Bureau Veritas Italia S.p.A. on July 23, 2013.